A GANG of men used a concrete slab to smash their way into a Knaphill supermarket on Bank Holiday Monday night. 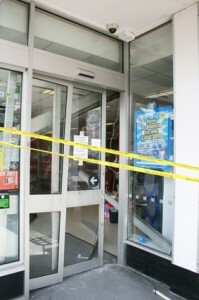 Around five to eight people took part in the robbery at the Co-operative store on the High Street at around 11.15pm. The thieves are believed to have escaped with hundreds of pounds worth of cigarettes and alcohol. Police confirmed that three men were later arrested during the early hours of Tuesday morning. Several residents dialed 999 after hearing glass smash at the popular shop. An eyewitness, who lives in one of the flats opposite and did not want to be named, said the raiders were all wearingbalaclavas. He said: “They placed their haul of cigarettes and booze on a blanket and attempted to pull it through the gap of broken glass. “As they couldn’t move it, two gang members were trapped inside and had to kick in the doors further to get themselves and their booty through the space. Surrey Police were called out to the incident at 11.45pm by which time the gang had made their getaway from the scene. The three men are believed to have been arrested some time later. A Surrey Police spokesman said enquiries were continuing and more arrests were likely. Knaphill residents have become increasingly concerned by levels of crime in the village during the past few months. presence here, we’re a bit cut-off.